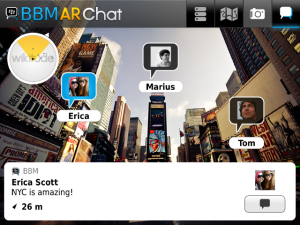 *Interact with your BBM contacts and discover new BBM users around you as you have never done before. *Search for specific places, for example "thai restaurant"
*Find mobile coupons and discounts for stores and shops near you Search through lots of exciting content and points of interest from Wikipedia, Youtube, Twitter, Flickr, Starbucks and thousands more. 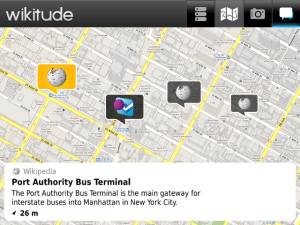 Use Wikitude to browse through what’s around you or to specifically search for places you are interested in. Craving sushi? Just type "sushi" into Wikitude’s search box, hold up your phone and see all the sushi restaurants around you. Looking for special offers near your home or nearest shopping centre? Simply view all the augmented reality mobile coupons to get up to 50% off ! 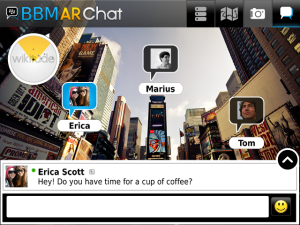 You can even create your own places in augmented reality, for example your favourite bar, restaurant or meeting point. 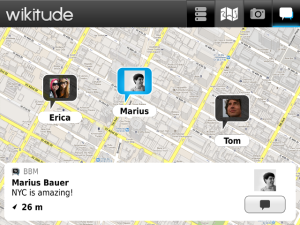 Go to www.wikitude.me and drop markers on a map to create your own place or hundreds of places. Hit the upload button and a few seconds later your personal places will be visible in the Wikitude.me World on your mobile. I have a blackberry torch 9810 its already got it installed when I click to go onit it says update I update it errors I have data plan and use wifi?? Why does it do this?? ?